18-Jun-2018 -- Serendipitously I had the chance to have an extra holiday, which I used to travel to Japan. I did a bicycle trip on the main island Honshu. While this I could manage to visit some confluence points. The third one was the CP 35°N 137°E. Nagoya is one of the biggest cities in Japan. So it was not a very 'smooth' or kind of relaxed bicycling, to reach this CP. In addition to this it rained the whole forenoon. Unfortunately in June is still rain time in Japan. But anyway I reached this confluence point short before noon. 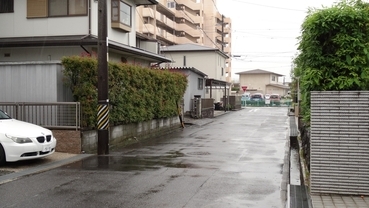 It is located in a normal urban residential area and situated exactly on a stripe of gravel which works as drainage, around a new built house. Google Earth "street view" is still showing the former house standing there, as to be seen on the pictures of the elder confluence point visits. Despite the rain I did the GPS-shot of the coordinates 35°N and 137°E without minutes and seconds! On the picture at the distance of 100 m the CP is located next to the house behind the brown house. Nobody passed by during my visit. After the visit of this CP I waited under a roof of a restroom house, at the Harasaki Park, for the end of the rain. Later that day I visited the very impressive Castle Nagoya, which is located at a distance of about 22 km beeline from the CP. Unfortunately the castle itself was closed because of restoration works inside and on the outer base. On the way to the castle I did a picture of a big cross road with HWY 1. In such a huge city it gave a very high traffic volume and a lot of noise. At luck the rain ended while my staying at the castle. My trip lead me further direction north west to the Lake Biwa and to the Japanese Sea. The confluence point 35°N 137°E was very easy to reach and it shows very clear how a location in a city can change.